Many, perhaps most, Wikipedia articles look like this when they are first accessed. 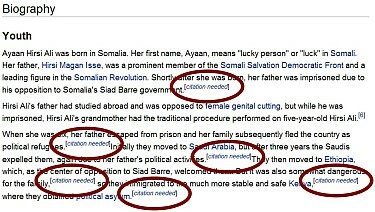 I have circled the “citation needed” notices. 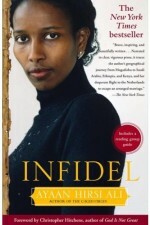 In Infidel, Hirsi Ali writes about her father, Hirsi Magan Isse, and his imprisonment. However, as far as I can tell, she never explains the cause of his imprisonment. We might assume from information she does give that he was imprisoned due to his opposition to Barre. However, I prefer to base my understanding on as few assumptions as possible, as often as possible. 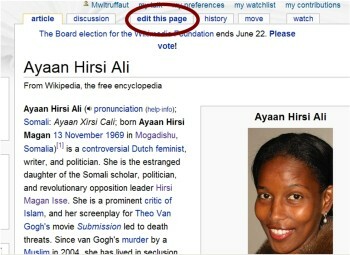 The family’s troubles began in 1969, the year Ms Hirsi Ali was born. That was also the year that Mohammed Siad Barre, a Somali army commander, seized power in a military coup. 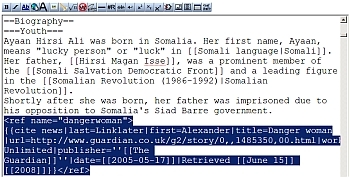 Hirsi Magan was descended from the traditional rulers of the Darod, Somalia’s second biggest clan. 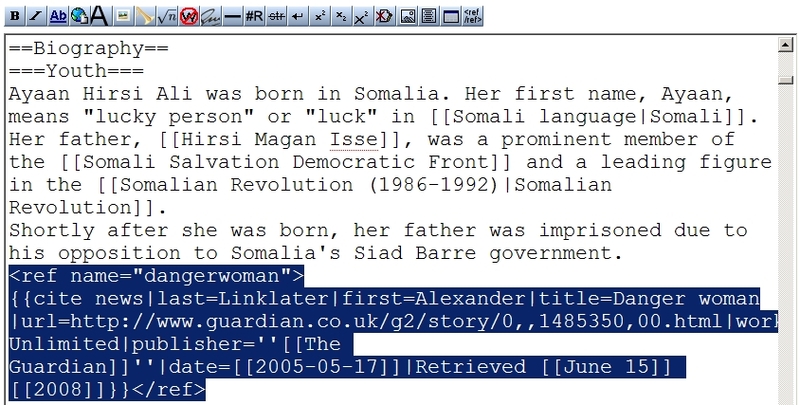 Siad Barre, who hailed from a lesser Darod family, feared and resented Ms Hirsi Ali’s father’s family, she says. In 1972, Siad Barre had Hirsi Magan put in prison from which he escaped three years later and fled the country. She remembers Siad Barre’s soldiers coming to the door one day and the tiny figure of her grandmother, knife in hand, standing up to the men and being tossed to the ground like a doll, in startling contravention of traditions of respect for older women as the men ransacked hidden supplies of food smuggled in by her mother. I feel confident that both sources are good for my purposes. So, I will add both as citations to the Wikipedia article. According to the Wikipedia entry on citing sources, contributors should try to be as consistent as possible within the article. Where possible, contributors should use the same citation format as the document’s originator. I notice that both of the sources I’ve gathered are already being used in the article. I click the “edit this page” tab at the top of the article page. I see that I can copy this code almost exactly for my own citation. I only need to change the “retrieved” date. So, I copy the reference entry. I am ready to paste the code back into the document in the appropriate place. I then click “Show Preview.” This allows me to look at my changes without actually applying them. I can see the citation looks as it should. The reference section at the bottom of the page also looks as it should. I apply my change. I then add the citation for The Economist newspaper. I don’t have the publication information handy because I viewed the copy at a public library and neglected to write it down. So, I list the article title and the publication date range listed on the cover. I then add the quote that supports the statement I’m adding the citation for. I later return to the library and record pertinent descriptive information (for example, the volume and page number) from a physical copy of The Economist. I then update my citation to show this extra information. I scrutinize my work once more and deeply approve of myself and what I’ve done. I scoot back from my desk and go to the fridge where I withdraw a Leinenkugel. I unscrew the lid as I walk back to my desk. I sit back and bask in my glorious wonderfulness. In Infidel, Barre’s name is spelled with an accent over the “e”: Barré. 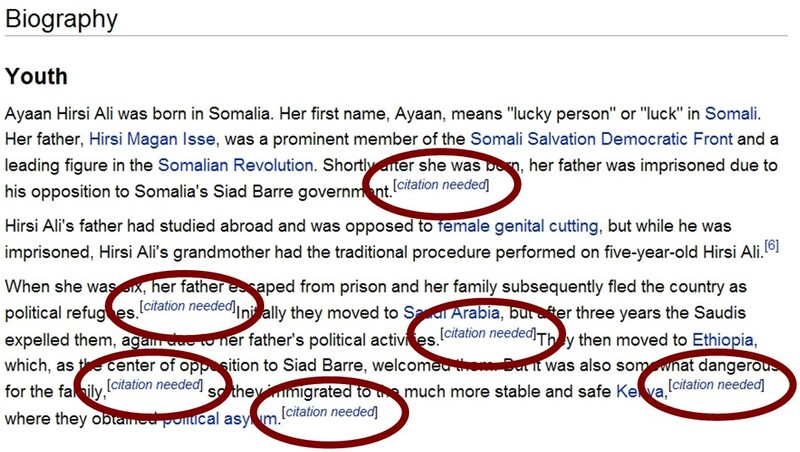 I can find no other examples of Barre’s name spelled this way in a publication other than Hirsi Ali’s book. Hirsi Ali’s page is “semi-protected” from editing. This means I had to be logged in to make changes to the article. “March 2008” would be replaced with the month and year corresponding to the month and year in which the editor is adding the code. Could you check in on how LL Cool J is doing? I hear he still thinks that fatties have led to more research on bacon. However, LL’s Wikipedia entry shows no such vandalism. Also, please save the Lightsaber Combat page from deletion. I only read a bit of the info in the lightsaber entry and a bit of the article where Wikipedia users present arguments for and against deletion. Personally, I find the information presented to be pretty interesting. I might like to see it combed over a bit for style consistency. I might also like to see a better “References” section. On the other hand, it seems possible to me that the Wookiepedia entry covering the same topic might already be a better alternative. I suppose I will leave it to those with a greater devotion to the Star Wars franchise. I hope you don’t mind if I read your comment as sarcastic. As it happens, I do sometimes read the backs of labels whilst defecating. Furthermore, and as you probably guessed, I often find this information interesting. For instance, did you know that the generic Wal-Mart brand of dandruff shampoo is “For external use only”? Well, after I read that, I started to drink much less of this product and, consequently, I spend much less time defecating. 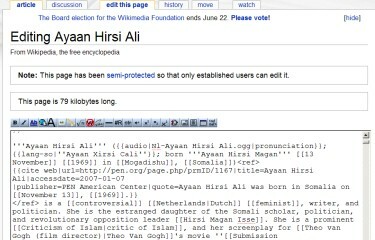 I hope this proves why my article on editing Wikipedia is so worthwhile.